Japan’s H-IIA rocket checked off a success on its first commercial mission to Geostationary Transfer Orbit on Tuesday, lifting the Canadian-operated Telstar 12V in a mission lasting four and a half hours and introducing a number of new technologies on the upper stage of the rocket. Liftoff from the Tanegashima Space Center took place at 6:50 UTC and H-IIA raced into sunny skies as it headed to the south east for a flight across the Pacific Ocean. 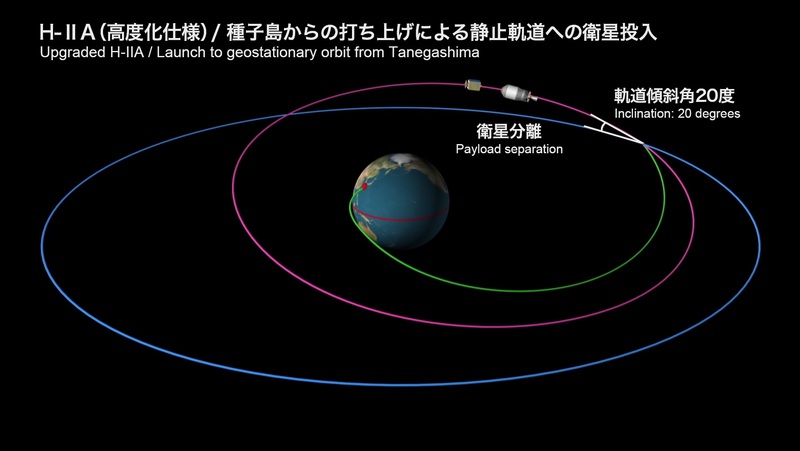 This mission used three burns of H-IIA’s second stage spaced by lengthy coast phases to enable the vehicle to reach a Geostationary Transfer Orbit with increased perigee for spacecraft separation at 11:17 UTC. Telstar 12V was the first commercial geostationary satellite contract scored by a Japanese launch vehicle. Although Japan’s rockets have been flying to Geostationary Transfer Orbit for the past four decades, they did not see any commercial launch business. A number of factors contributed in recent years to a shift in the satellite launch business as some operators placed their satellites on launch vehicles that were not usually part of the commercial launch market – Atlas V and H-IIA. These factors include the booked manifests of the large commercial launch providers Arianespace and SpaceX as well as the reliability issues of the Proton-M rocket – persuading satellite operators to accept the higher prices of Atlas V and H-IIA. Japan, achieving its first successful orbital launch in 1970, was rather slow to enter the commercial launch market. 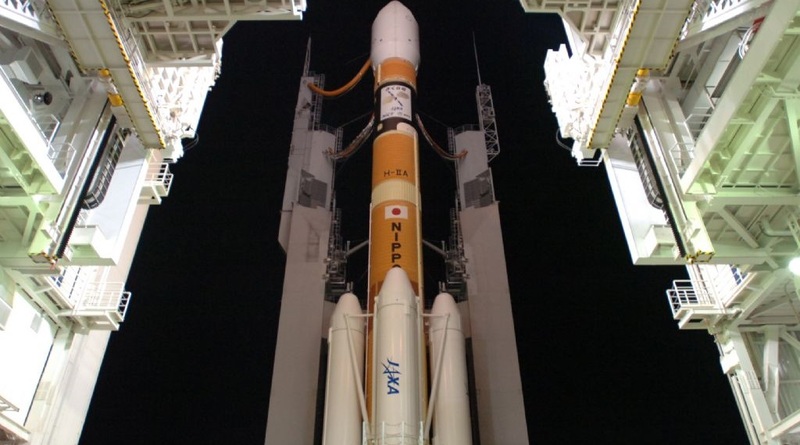 One contributing factor to Japan’s struggle in the commercial launch business was the reliability of its launch vehicles, particularly the H-II rocket that almost received a commercial launch assignment under a contract that was canceled after two failed missions. 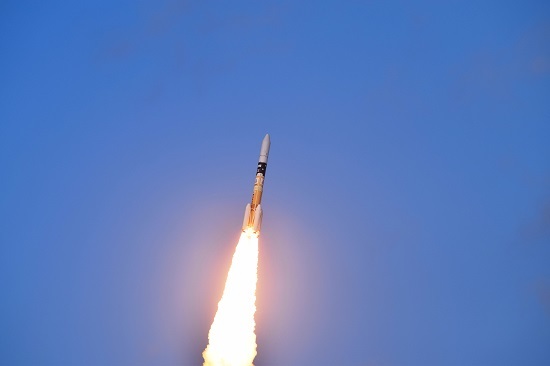 The introduction of the H-IIA brought a significant increase in reliability and the rocket is now on-par with Ariane 5 and Atlas V in terms of success rate. Telstar 12V will take a spot in Geostationary Orbit above the Atlantic Ocean to deliver expanded coverage for television broadcasters and mobile users from Latin America to Europe and the Middle East. 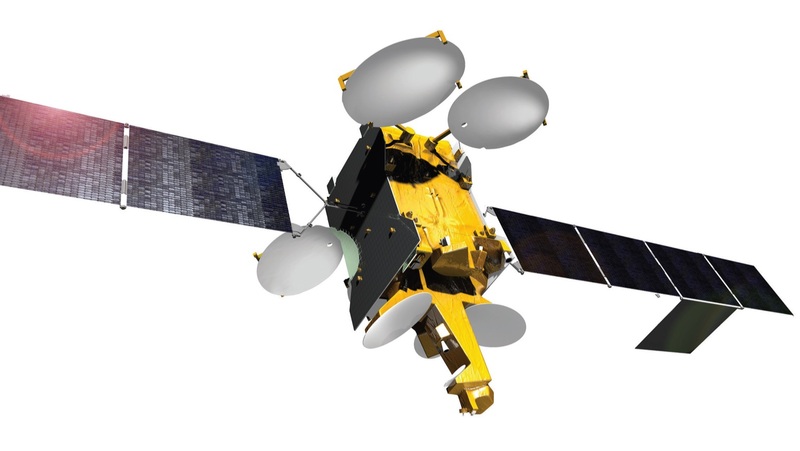 The contract for the launch of Telstar 12V was signed between Telesat and H-IIA operator Mitsubishi Heavy Industries in 2013 shortly after Telesat ordered the spacecraft from Airbus Defence and Space. This marked the first contract for a dedicated commercial H-IIA flight. 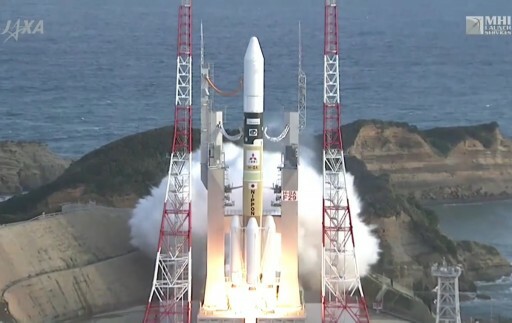 The launch mass of the satellite was over one ton smaller than H-IIA’s theoretical GTO capability, but to sensibly use this excess in performance to place the satellite closer to its operational orbit, H-IIA had to be modified to be able to conduct extended missions over four hours in duration. 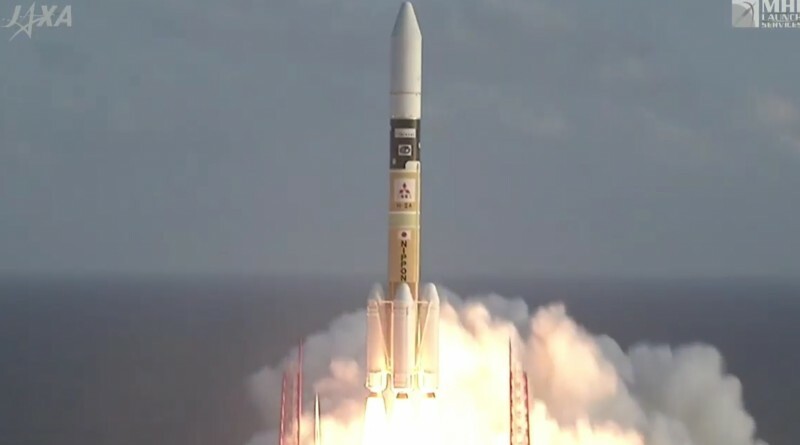 The capability of launching large satellites into higher orbits is standard for all other launchers on the commercial market and Japanese officials identified the need for H-IIA to match these capabilities several years back. 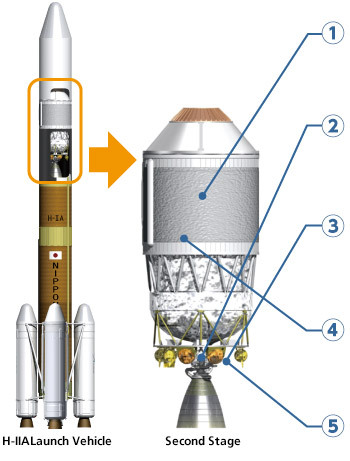 The upgrade program of the H-IIA called for a number of modifications to the made to the second stage to make it fit for long mission durations – enabling it to complete lengthy coast phases to gain the ability of maneuvering at the high-point of its transfer orbit for an increase in perigee and decrease of inclination, reducing the maneuvering propellant needed by the satellite to reach its working orbit. A new thermal insulation and white paint was added to the second stage to limit boiloff from the cryogenic tanks. To further save Liquid Oxygen, a new technique was developed for the in-flight chilldown of the second stage engine’s turbopumps by trickling LOX through the piping. To be able to support long mission durations, a high-capacity battery was added to the second stage and a Passive Thermal Control technique was introduced to constantly roll the stage and evenly distribute sunlight on its surface, preventing thermal gradients from building up. A propellant settling system was developed, running boiloff gases through thrusters on the aft end of the stage, providing a small thrust component to keep the propellants at the aft end of their tanks to avoid slushing and maintain a clean two-phase mixture inside the tanks. 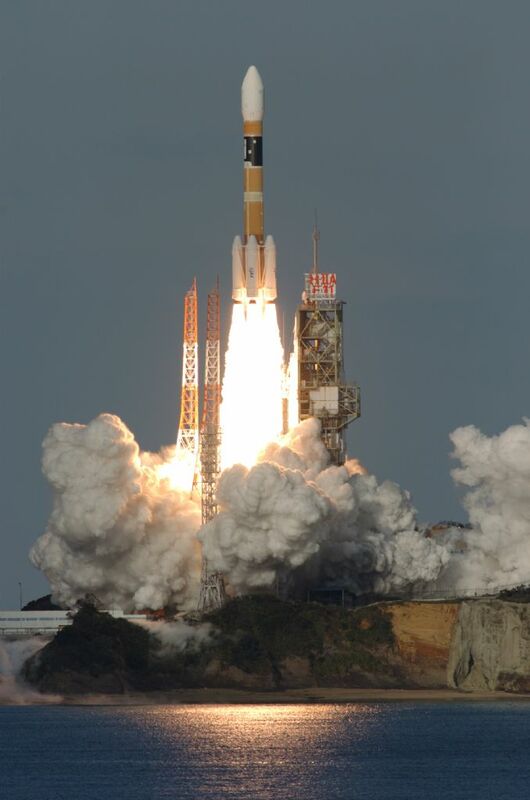 Previously, H-IIA used its Hydrazine-fueled reaction control system for propellant settling, but a mission of four hours would not be possible with the available propellant. One additional modification made to the second stage certified the LE-5B engine for operation at a 60% thrust setting, to be used in the final burn of the mission to increase the accuracy of the orbital insertion possible with H-IIA. H-IIA headed into a long countdown in the late hours, local time, on Monday when the 53-meter tall rocket emerged from its Assembly Building for the 500-meter move to Launch Pad 1. Employing its most powerful 204 configuration, H-IIA enlisted the help of four Solid Rocket Boosters attached to a two-stage stack for a total launch mass of 443,000 Kilograms. Once centered on the pad, the Mobile Launch Platform was connected to the various ground systems including propellant, power and data interfaces. Team made final close outs and prepared the vehicle for tanking before evacuating the complex as the 400-meter safety zone came into effect. 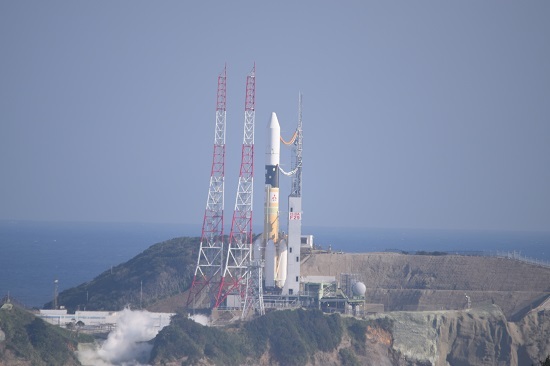 About 8.5 hours before liftoff, H-IIA’s various systems were powered up to begin a detailed set of testing activities that included communication checks via its S-Band and C-Band systems, Flight Termination System Testing, and the initialization of the Flight Control System. With the safety zone widened to three Kilometers at around X-7 hours and 30 minutes, the first steps of the three-hour long propellant loading sequence were initiated. Entering cryogenic tanking, the first stage was loaded with 87,100 Kilograms of -183°C Liquid Oxygen and 15,700kg of -252°C Liquid Hydrogen while the second stage received 14,100kg of LOX and 3,100kg of LH2. Tanking entered replenish just inside X-4.5 hours and testing of the launcher continued throughout the tanking operation as H-IIA went through communication checks, Flight Control System checks, verifications of the Flight Termination System and a readiness check of all ground systems. Heading into the final hour of the count, the last set of reconfigurations was started on the launcher, including the upload of updated flight software. Additional excitement emerged in the final minutes leading up to polling of the Launch Team when a boat drifted into the closed downrange safety zone. Because of the range clearance issue, H-IIA’s countdown entered a hold and teams communicated with the vessel to have it move out of the area. Countdown clocks held for 27 minutes, taking advantage of this mission’s long launch window. Getting ready for launch, Telstar 12V switched to battery power and all stations reported a GO for liftoff, permitting the countdown to head into its Automated Sequence at X-4 minutes and 30 seconds. Throughout those final countdown minutes, computers choreographed the events of the countdown and monitored all vehicle parameters, ready to trigger an abort in case of problems. Tanks on both stages were topped up at flight level and began pressurizing their tanks using Helium gas while H-IIA transitioned to battery power. One minute prior to launch, the sound suppression system started pouring water onto the launch pad followed by the arming of onboard ordnances and the transfer of the guidance system to its flight mode coinciding with the activation of the thermal batteries on the boosters powering the thrust vector control system. The LE-7A main engine was commanded to ignite at X-5.2 seconds as the main fuel valve was opened and the turbopump turbines began spinning up before oxidizer valves were opened and the combustion process was triggered within the gas generator and combustion chamber. Soaring up, the engine reached its liftoff thrust of 86,000 Kilogram-force, carefully monitored by computers. Upon ignition of the four SRB-A3 boosters at 6:50:00 UTC, the H-IIA rocket rapidly jumped off its pad with a total thrust of 1,035 metric-ton-force – creating an initial thrust to weight ratio greater than two, making for a very fast initial climb. After rising vertically for just a few seconds, H-IIA made its pitch and roll maneuver, starting a south-easterly flight path across the Pacific Ocean. The four boosters provided 90% of H-IIA’s total thrust, delivering the kick needed to push Telstar 12V to Geostationary Transfer Orbit. Heading uphill, H-IIA pushed through the sound barrier and passed Maximum Dynamic Pressure at the one-minute mark into the flight – burning 2,550 Kilograms of propellant each second of powered flight. Each of the SRB-A boosters of the H-IIA rocket delivered 2,260 Kilonewtons of thrust, measuring 15.1 meters in length and 2.5m in diameter with a launch mass of 76.6 metric tons, including 66,000kg of propellants consumed during the first 116 seconds of powered flight. Burnout of the boosters was sensed by their declining chamber pressure after they helped accelerate the rocket to over 2 Kilometers per second. To ensure the boosters tailed off any residual thrust and made an off-shore impact, H-IIA held them for another nine seconds. Separation of the boosters was accomplished using pyrotechnics to cut the structural connection of the boosters that then rotated outward on thrust struts for a clean separation at an altitude of 80 Kilometers. 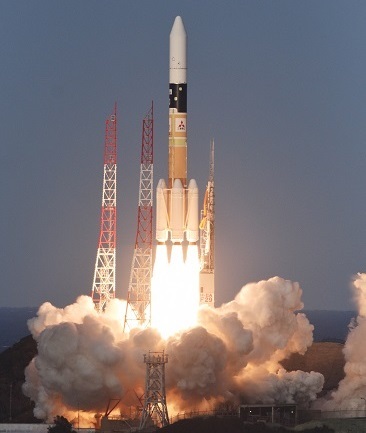 H-IIA continued onward powered by its core stage alone, burning 260 Kilograms of cryogenics per second to generate 109,000 Kilogram-force of thrust as the vehicle departed the dense atmosphere. Overall, the first stage of the H-IIA is 37.2 meters long and 4 meters in diameter, hosting the 3.7-meter long LE-7A engine that burned through a total of 103 metric tons of propellants. The Core Stage showed excellent performance throughout its long burn, sticking right to the predicted flight path in the center of the launch corridor. Passing 150 Kilometers in altitude three minutes and 25 seconds into the flight, H-IIA separated its payload fairing. This flight was the first to use the 4S model fairing, measuring four meters in diameter and 12 meters in length. Six minutes and 40 seconds into the flight, the first stage shut down its LE-7A engine after boosting the vehicle to 6.1 Kilometers per second. 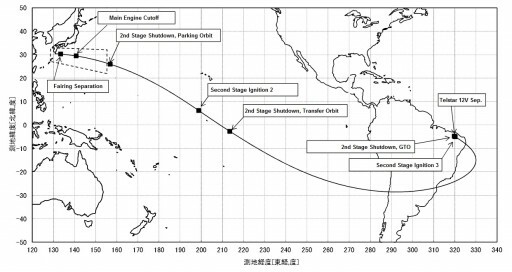 Stage separation occurred eight seconds later at an altitude of 245 Kilometers and was followed another six seconds later by the ignition of the LE-5B engine of the second stage. The second stage of the H-IIA is 9.2 meters long with a diameter of 4 meters. It also uses LOX and LH2 propellants, being filled with 17,200kg of cryogenics for consumption by the single LE-5B engine that delivers 13,970 Kilogram-force of thrust and provides re-ignition capability. 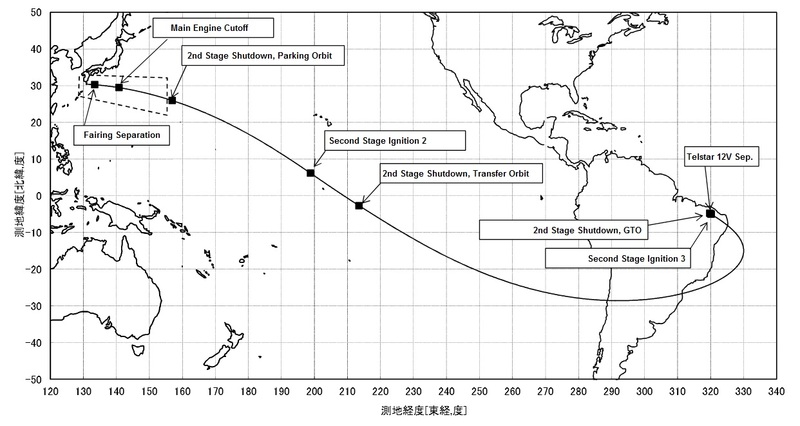 Firing the engine just shy of four and a half minutes, the second stage successfully boosted the vehicle to an elliptical Parking Orbit for a short coast phase. The 11-minute coast allowed the vehicle to continue flying south-east so that the second burn could center the equator passage in order to raise the apogee of the orbit to a position directly over the equator. Re-starting the engine 23 minutes into the flight, the second stage burned for nearly four minutes, raising the apogee near Geostationary Altitude. At the conclusion of the burn, the second stage began a Passive Thermal Control roll to settle down for a coast phase of three hours and 56 minutes. This long coast was needed for the vehicle to reach a position near the apogee of its orbit so that the third burn of the second stage could raise the perigee of the orbit and reduce the inclination in order to drop the satellite off closer to its operational orbit. The critical third burn occurred four hours and 22 minutes into the flight and used the new 60% thrust setting on the second stage for a more finely controllable insertion with the goal of placing the satellite into a very accurate orbit. The burn lasted 46 seconds and increased the vehicle’s velocity by around 300m/s aiming for an orbit of 2,700 by 36,585 Kilometers at an inclination of 20.1 degrees. At the conclusion of the third burn, the second stage re-oriented for the release of the spacecraft – utilizing a new low-shock adapter to reduce the stresses encountered by the payload. Telstar 12V was sent on its way four hours and 27 minutes after launch, marking the successful completion of H-IIA’s first commercial launch – pending orbital tracking data expected to be acquired later on Tuesday. 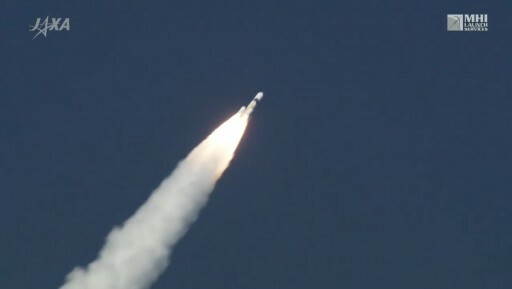 Tuesday’s launch was the fourth and final for the H-II launcher family in 2015 after two H-IIA launches in February and March carrying semi-classified Information Gathering Satellites and one H-IIB launch in August lifting the fifth H-II Transfer Vehicle to orbit for a resupply mission to the International Space Station. 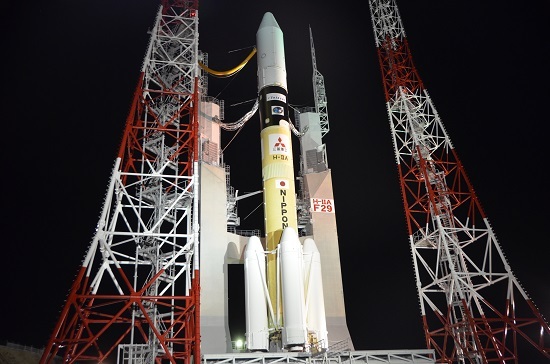 The next Japanese launch will take place early in 2016 and see an H-IIA rocket carry the Astro-H X-ray observatory to orbit.